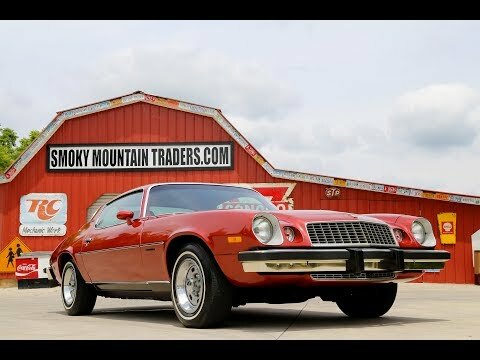 Up for sale we have a 1977 Chevrolet Camaro LT. This a very special car, as it is mostly all original and in excellent condition. We have numerous documents from over the years including the Build Sheet and original Purchase Agreement. This car has excellent fit of all the panels with all the gaps being even and symmetrical. As far as we can tell this car still has all original paint which is the Firethorn Red. The paint is in phenomenal condition for its age and down the sides are straight as an arrow. The trim and chrome follows suite as it's remarkable how nice every piece is considering its age. All the glass in this Camaro is factory as well. All the lights are working including the tag light and reverse lights. To complete the look its sitting on the 14” Rallyes with a set of Michelin White Walls. On the inside, it also all appears factory as well. It's done in the Firethorn with Bucket Seats and console. The seat covers and padding are in great condition along with the carpet. The headliner is loose in a couple of places but is still very nice. Looking at the dash you'll be impressed with how nice the pad and gauges are. Everything in the dash is working with exception of the clock, even the lighter still works. The factory radio is working and the Air Condition blows just as cold as it did when it was brand new. Under the hood everything looks just as it would have when new in '77. It features the matching numbers 305 Engine that's setup with the stock style intake and 2 Barrel Carb. The engine is mated to the matching numbers 350 Trans and correct 10 Bolt Rear End with 2.56 Gears. The exhaust flows through stock manifolds with single exhaust back to the dual out mufflers with dual tail pipes. To go along with the Air Condition this Camaro also has Power Brakes with disc up front and drums out back. Under the front it has Power Steering and all the components seem to be original, but are in great condition. The floors and frame in this Camaro all appear rock solid with no signs of repair.